Moore, born 1829 in Gainsborough and died in London in 1880, became known as a genre, portrait and landscape painter. He was a pupil of his father William Moore (landscape painter in York) and William Etty. Moore spent time In Rome, therefore Campagnaszenen are also known from his hand. He exhibited at the Royal Academy during his lifetime. 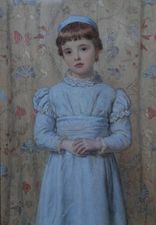 Portrait watercolors of Moore can be found today at the Victoria and Albert Museum in London.